Catwoman Adult Woman Costume; Adult Catwoman Costume. Includes headpiece & jumpsuit with attached glovelets. 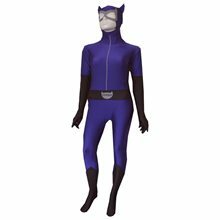 Officially licensed Catwoman Costume.The costume available in medium size. Catwoman Dark Knight Adult Mask Goggles; Catwoman Dark Knight Adult Mask Goggles Includes: Goggles, Mask. Catwoman Dark Knight Rises Adult Wig; This Catwoman Wig will be sure to transform your costume look! Catwoman Dark Knight Rises Child Wig; Batman: The Dark Knight Rises Catwoman DC Comics super hero character wig. 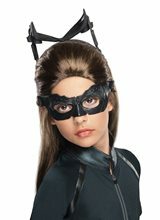 Children's size Catwoman costume wig. Catwoman Two-Faced Adult Costume.Includes: Bodysuit with lace-up sides and sleeves detail, mask and ears. Available Size: Womens - Small/Medium, Womens - Medium/Large. (See Size Chart For More Information) *Whip, Shoes and Accessories Not Included. Sold Separately. Material: 92% Polyester / 8% Spandex.Care Instructions: Hand wash separately. Drip dry. Do not bleach.Be Wicked Two-Faced Catwoman 3 piece costume set includes stretch lame bodysuit with lace up sides and sleeves detail, mask, and ears. Whip is not included.Made in China.